One of the fundamental principles of medical therapy in Australia and most other western nations is that an adult of sound mind should be able to chose their own therapy, or choose to forgo therapy completely. To make these choices, people need access to the best available information. However, when it comes to complementary/alternative medicine this information often gives a false sense of the effectiveness of CAM therapies. Nowhere is this more true than in cancer therapy. Cancer and it's treatment is a very emotive issue. Having lost several family members to cancer, including my greatly loved mother-in-law, I've experienced some of this first hand. Unfortunately, an article in this Saturdays Advertiser, "Why a brave mum said no to chemotherapy", gives a very misleading idea of the effectiveness of alternative cancer therapies, which could potentially endanger lives. I don't want to denigrate the experience of the author and her mother, but in trying to explain why her mother chose alternative medicine, a lot of factually incorrect or misleading information is presented by the author. It's interesting to note that when an alternative cancer treatment fails, the practitioner is denounced as a charlatan. But when conventional treatment fails and research shows it fails 75 per cent of the time, we assume "it was their time" and that the doctors "did their best". What research is this that shows conventional treatment fails 75 percent of the time? For which cancers? For uterine cancer, 81% of patients will survive 5 or more years, for ovarian cancer it's a more sobering 40% survival. As the authors mother had ovarian/uterine cancer presumably she was talking about ovarian cancer (which as a much better survival rate than the 25% stated), but the way this piece is written it suggests that this is true for all cancers. For cervical cancer the survival rate is 65%, for breast cancer the survival rates on average are around 88%, you can get a good overview of cancer survival in Australia here. On the other hand the success of alternative medicine in treating cancer is the same as if you had been treating cancer with sugar pills. This is why alternative medicine practitioners are called charlatans, because they provide treatments that have either been shown not to work, or have no good evidence that they work. An example is the Gerson Therapy, lauded in this article. A punishing regime of strict diet, vitamin supplementation and coffee enemas, it doesn't work, and has significant risks of side effects (some more information on how shonky it is here). The Gonzalez protocol, based on the Gerson therapy doesn't work either. Oh, you can certainly get testimonials, but these are subject to selection bias, recall bias and without adequate controls on diagnosis and follow up, you have no idea what is happening. And of course the alternative medicine people never publish testimonials like this. There were plenty of jokes about Mum going upstairs to have a "crappuccino", but the aim of the coffee enema is to detoxify the liver, which many believe is the most important organ for cancer recovery. Except this is absolute rubbish, the enemas do nothing what so ever to the liver (which contrary to alt-med belief are not massive stores of toxins). Pumping coffee into your intestine might stimulate the intestine to contact a bit more, but this will do nothing to affect the mutant, out-of-control rapidly growing cells that are cancer (or "cleanse" the blood). The bowel seems to be a fixation for alt-med, but the whole idea that the colon needs to be "cleansed" is a myth. Then there is the vitamin C infusions: . 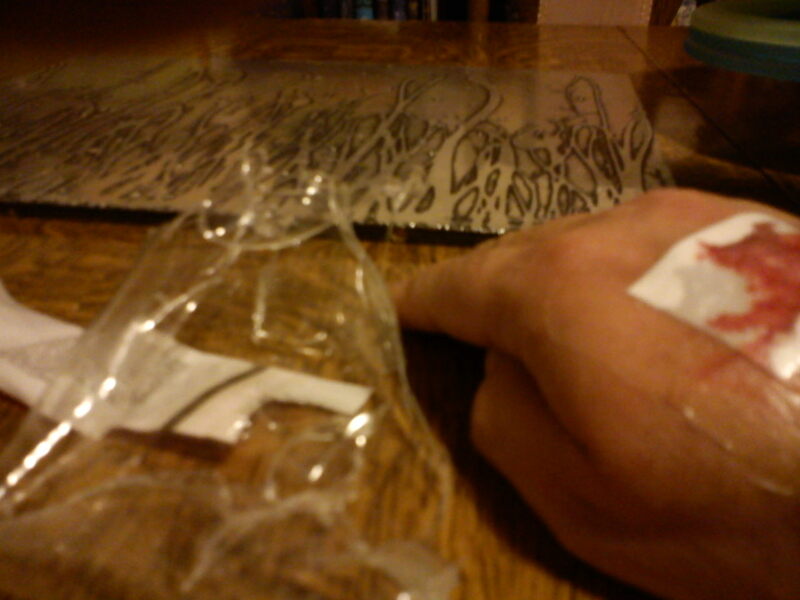 ..up to 75,000mg intravenously every week. To give you some idea of how much vitamin C we're talking, the RDA is 80mg. The treatment may sound crazy, but it's hard to argue with the evidence. And the evidence is that it doesn't work. Proper controlled trials of vitamin C therapy have shown no benefit (as opposed to Linus Paulings shambolic attempts which didn't include proper controls). Sure if you put enormous quantities of vitamin C on cancer cells in culture dishes you will kill them, so will extract of old boots (in my day job I do experiments with cancer cells, so I am aware of the pitfalls of this kind of experiment). These tissue culture experiments don't reflect what would happen in a real clinical situation. So the author's mum is taking potentially dangerous treatment with no proven benefit. Wait, you are saying, surely vitamins aren't harmful. At that level they are, with the potential to cause renal disease. Supplemental vitamins, above what is necessary to prevent vitamin defficenacy, have been linked to adverse our comes (see here and here). Oh yes, and Black Salve is not a cancer specific curing agent, it's a generalised corrosive agent. The author reminds us that cancer treatment is big business for pharmaceutical companies, giving the impression that alternative medicine is all warm and fuzzy. Make no mistake, alternative medicine itself is big business, in 2004 Australians spent 4 times the public expenditure on the PBS on alternative therapies. "Why poison yourself with something you don't believe in?" was Mum's answer to the inevitable chemo question. But some people really do believe in the power of chemotherapy, and for those people having chemo is the right thing to do. This, I think cuts to the heart of everything, it's all about belief. So instead of poisoning themselves with things they don't believe in they will poison themselves with things they do believe in. Yet cancer doesn't care what you believe in, and neither does chemotherapy, it works or it doesn't regardless of your belief in it. The author has claimed to have used her journalistic experience to study cancer therapy, but it doesn't take much to discover that the therapies portrayed in the article are not only useless, but potentially harmful. As such this is grave disservice to those cancer sufferers and their families considering treatment options. "In 1970 the overwhelming majority of scientists believed that there was not going to be going to be global warming over the next 40 years..."
If he had bothered to do any research, rather than buying into denialist myths, he would have found that most research was pointing to warming, and that warming was a long-standing prediction of physics (see also this article). "The interesting thing to me about science is that it's given the benefit of of the doubt in ways that Christianity used to be given the benefit of the doubt." Well, if it were true, that would because science has runs on the board in way that religion hasn't. From the eradication of small pox to landing people on the Moon, science has proved its credentials. Whenever you use your mobile phone, you are using the practical application of quantum mechanics and the theory of relativity. Religion ascribed epilepsy to demonic possession, a few Christian sects still do, with tragic consequences. But science is unravelling the causes of epilepsy and has developed effective treatments. So science has earned the benefit of doubt. But in fact, science rarely is given the benefit of the doubt. From global warming, to tobacco and cancer, to acid rain, to heart transplants, to IVF, to the ozone hole, to collapse of fish stocks from overfishing politicians, entrenched interests and often religious leaders have fought tooth and nail against the scientific consensus, only relenting (sometimes) when scientists have been shown incontrovertibly, sometimes tragically, right. Between The Australians War on Science and members of the Catholic Church spreading misinformation on condoms and AIDS, it's obvious that science isn't being given the benefit of the doubt and is being actively opposed. 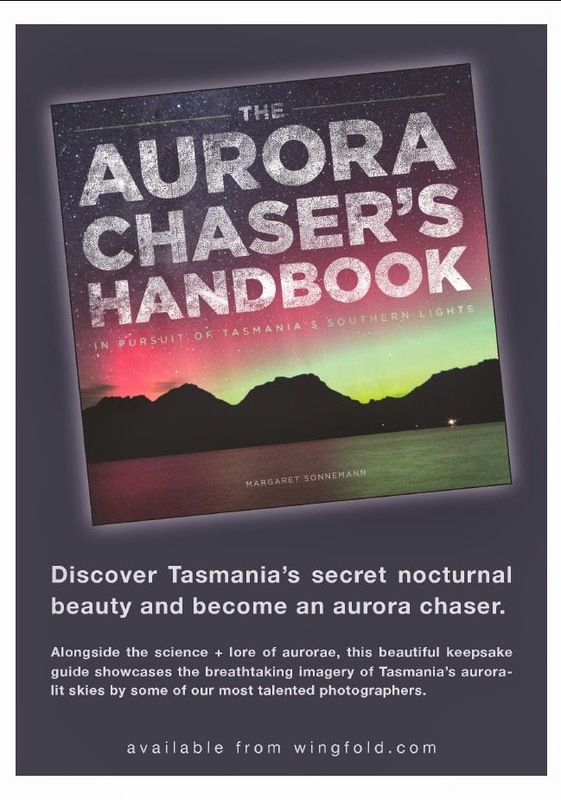 Blainey has written some wonderful history, his "Tyranny of Distance" was a seminal work of Australian history, it's a pity his comments on science are fantasy. UPDATE: Interesting discussion in the comments thread on Deltoid's article mentioning this one. Left image: Location of Jupiter above the north-east horizon as seen from Adelaide tonight, Saturday October 29, at 10:00 pm local daylight savings time. 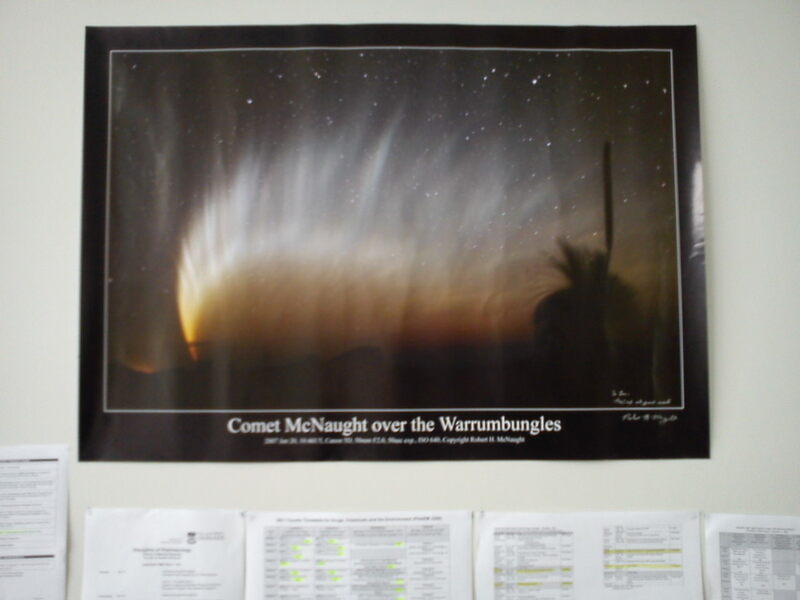 Similar views will be seen at equivalent local times elsewhere in Australia. Right Image: The view of Jupiter as seen through a small telescope at the same time. The Opposition of Jupiter is tonight, when Jupiter is biggest and brightest as seen from Earth. Look to the North-east in the early evening, and the north in the late evening. It's the brightest object in the north-eastern sky at the moment. Don't worry if you can't see it tonight, it will be big and bright for many weeks to come, and a worthy target in binoculars or small telescopes. Space is big, space is very, very big. The scale of it overwhelm us, and trying to get some perspective on the scale can be a bit daunting. People have tired various ways to get the scale across, I've tried apples and Lillypillies in my back yard, there's a website with the images scaled so that you have to scroll forever (see also here), a series of flags in the courtyard of Scienceworks in Melbourne, and a Solar System Trail from St Kilda to Port Melbourne where the 5.9 Billion Km form the Sun to Pluto is scaled to 5.9 Km. The most spectacular of these attempts is the Solar System Drive, a 200 Km drive from Siding Spring Observatory in the Warrumbungles (where the 37 meter dome Anglo Australian Telescope represents the Sun) to Dubbo where Pluto is located (and also Merriba, Tamworth, Narrabri and Gulgong, the outer planets are placed on 5 roads leading to Siding Spring, click on the images to embiggen) . The Planets are all scaled to the the ratio of the AAT dome to the Sun, and are placed on large bill boards (see images above, click to embiggen). We visited it as part of the Road Trip! and visiting Pete Poulos (that's another story for later). It's spectacular, especially the first bits as you go down the winding mountain path fro Siding Spring. The inner planets are placed near some awesome views. But they are also distracting, there's a lot of sheer vertical cliff on those roads, and you don't want your attention taken away from the road too much (I only took a few shots because it was too difficult to stop). If heading off to Central New South Wales is not on your agenda, try making your own scale Solar System Model in your back yard or along a local road (here's another version). The subject line and image says it all. WARNING SIGNIFICANT EYE HAZARD, experienced observers only should attempt this observation. Left image: The location of the Moon relative to the Sun just before Mercury is occulted. 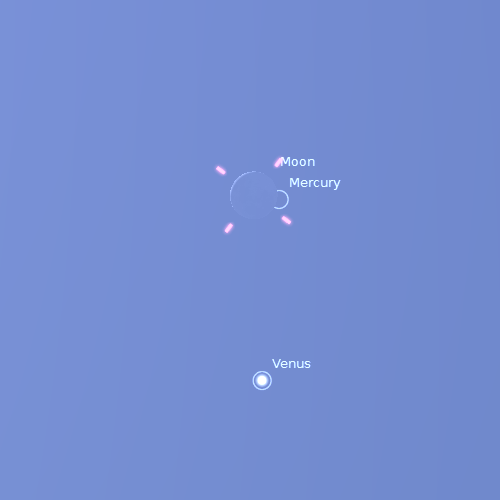 Middle Image: Approximate binocular view of the Moon, Venus and Mercury. 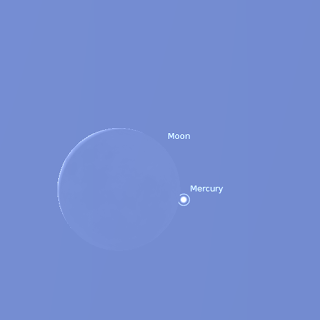 Right Image: Location of Mercury just before occultation as seen with medium power telescope objectives. 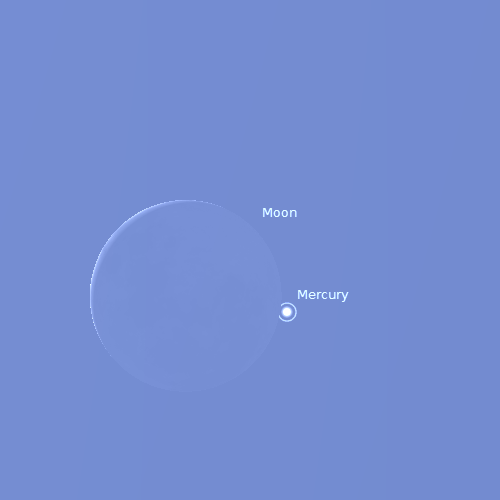 The thin crescent Moon will occult the planet Mercury during the daylight hours of Friday October 28 as seen from Australia. Observing this occultation requires EXTREME CAUTION due to the possibility of eye damage. It can only be seen with good binoculars or a telescope, and every precaution MUST be taken to avoid the Sun being glimpsed through the telescope or binoculars as eye damage will occur. Don't attempt this unless you have some experience. Make sure that the Sun is blocked by a seriously hefty object (like a wall or building, a tree isn't good enough), before attempting to observe. You must be sure no accidental telescopic or binocular exposure to the sun occurs. The Moon will be a wire thin crescent (possibly difficult to see without binoculars), and Mercury a pale dot in any instrument you use, and it will be very difficult to see the unilluminated part of the Moon. This event will be seen Australia wide . Times of appearance and disappearance are given in the table below. 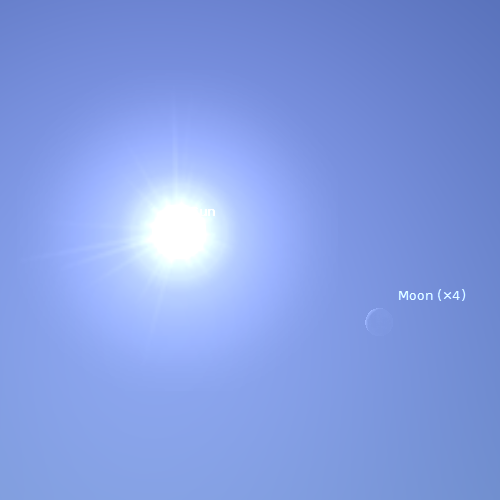 The occultation is also visible for New Zealand, Indonesia and parts of South-East Asia, see http://transit.savage-garden.org/en/occultations/ for maps and times in UT. The First Quarter Moon is Thursday November 3. Venus is easily visible in the western evening twilight with Mercury below it. 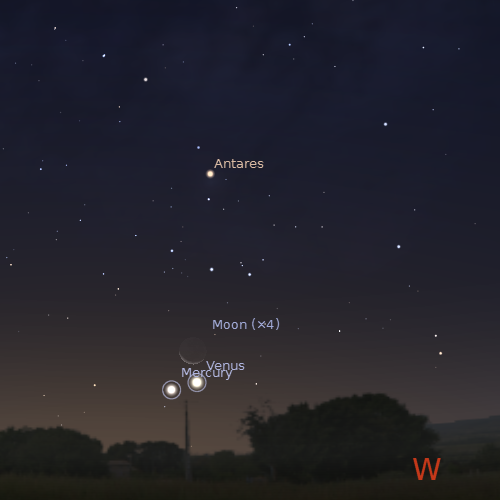 The Moon joins Venus and Mercury on the 28th. Jupiter now dominates the evening sky and is at opposition on the 29th. 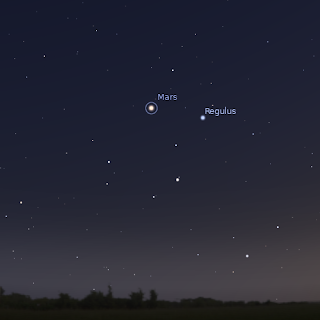 Mars is visible in the morning sky nearing the star Regulus . Comet C/2009 P1 Garrad is visible in binoculars in the north-western sky. Morning sky looking north-east as seen from Adelaide at 5:30 am local daylight saving time on Sunday October 30 showing Mars and the brighter stars. Similar views will be seen elsewhere at the equivalent local time. Click to embiggen. The First Quarter Moon is Thursday November 3. 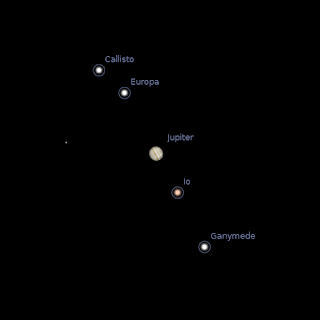 Jupiter is at opposition, when it is biggest and brightest as seen from Earth, on Saturday the 29th. Jupiter is visible all night long now. 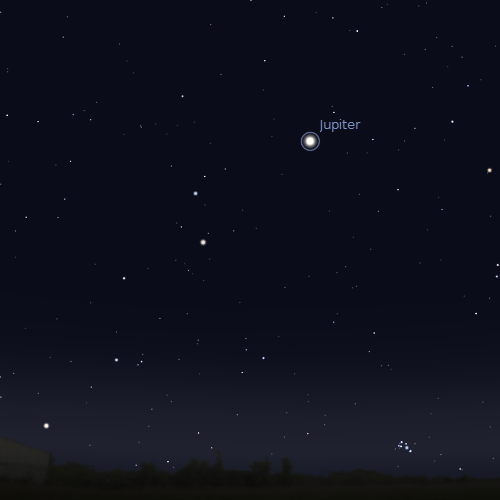 In the evening Jupiter is readily visible in the north-eastern sky, from about 7 pm local time on. Now is a good time to begin telescopic observation of this massive world, or follow its moons in binoculars. For good telescopic observation Jupiter is best from 10 pm - 1 am. Although it is biggest and brightest on the 20th, Jupiter will be excellent viewing for a couple of months now. 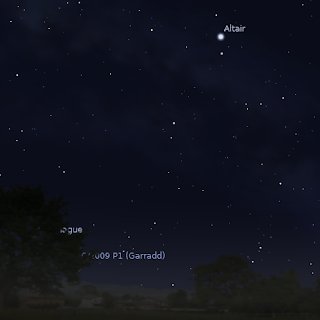 Mars is low in the north-eastern morning sky, in the constellation of Leo. 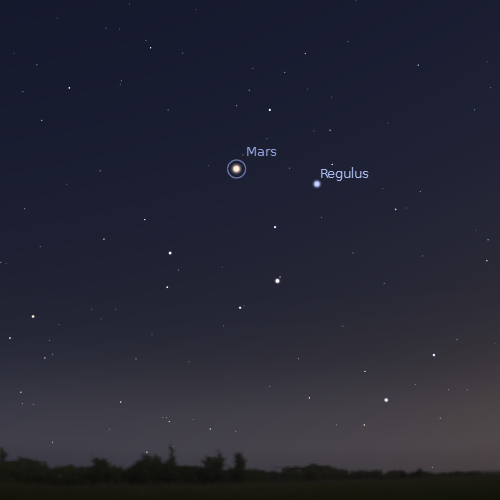 Mars comes closer to the bright star Regulus over the week. Saturn is lost in the twilight glow. Bright white Venusand Mercury are now readily visible in the evening western twilight sky from around half an hour after sunset for somewhat over an hour. Mercury is visible below Venus at the beginning of the week, and becomes more prominent, and closer to Venus, as the week wears on. Both planets climb higher in the evening sky over the week. On the evening of Friday the 28th, the thin crescent Moon is close to the pair, making excellent viewing. Comet C/2009 Garrad is visible in binoculars in the north-western sky, in the constellation of Ophiuchus. Although it has brightened substantially, it is still only a fuzzy dot at magnitude 6.5. 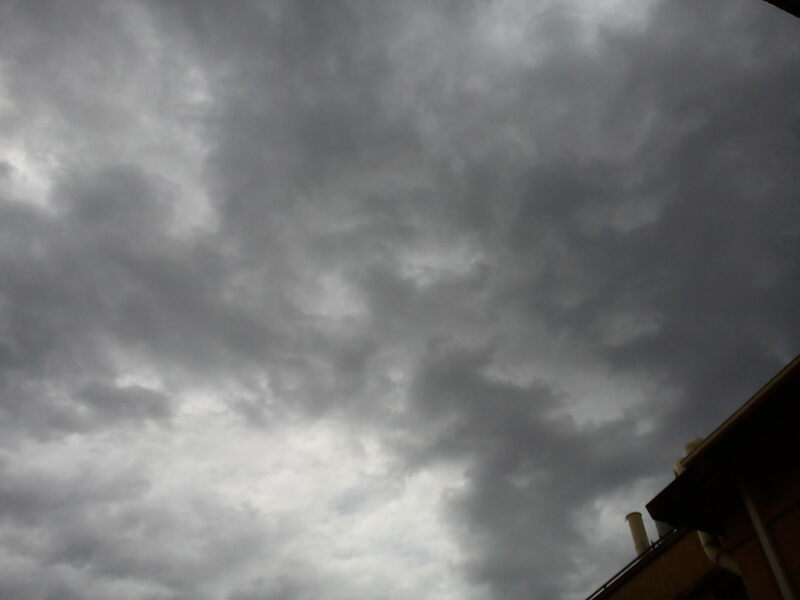 The best views will be under dark skies, where you might spy a short faint tail. The best viewing is just before 9:00 pm, when the sky is dark enough to reveal the comet and it is not too close to the horizon. This will be the last week the comet will be easily visible, before it comes too close to the horizon for viewing. It will enter the morning sky in November. 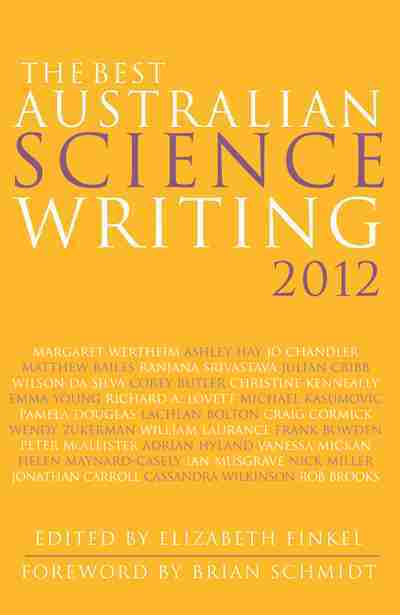 Carnival of Space #220 is here. Carnival of Space #220 is now up at We Are All In The Gutter. There's Tweetups, competitions, lots of musings on spaceflight, the legal implciations of falling satellites and much, much more. Launch yourself over and have a read. Venus (bright dot) and Mercury (not so bright dot below and to the left) above the ocean at Largs Bay at around 8:15 pm local daylight saving time (click image to embiggen). Portrait of Copernicus, 1580, Toruń Old Town City Hall Image Credit WikiPedia. I have been a fan of Dava Sobel ever since I first read "Longitude", so I was excited to receive a copy of her latest book "A More Perfect Heaven". Ms Sobel has written quite a bit about the solar system and the social and scientific mileau that existed as we came to understand the our place amidst the myriad worlds, and this latest book extends that work. In "Galileo's Daughter", we saw Galileo and the development of his work on heliocentrism through the eyes of his daughter, a cloistered nun. This time Ms Sobel looks at Copernicus, the developer of the heliocentric theory that Galileo championed (you can see an animated comparison of the theories here). This work is a superb treatment of Copernicus the man, and the political and scientific climate that prevailed as he developed his work. You won't find out what exactly an equant is, or why it was so important that Copernicus banished it, or why perfect circular motion was an obsession with medieval astronomers, but the account of the man himself and the struggle to develop his theory in a time of upheaval is riveting. For most people, if you have an image of Copernicus at all, it is as a cloistered monk bent over parchment. Ms Sobel introduces us to a person who is almost the antithesis of this image. The Copernicus who frantically organised the defence of Allenstein in the face of a near invincible invading army, and yet still found the time to do astronomical observations, was no mere cloistered monk. Copernicus was a complicated man living in complicated times. Ms Sobel paints a compelling picture of him and those times, the intellectual ferment, the politics and duties that took Copernicus away from his astronomical work, and the circle of friends and confidants that commented on and encouraged his astronomy. Despite encouragement, and entreaties, Copernicus had decided he would not publish his work on heliocentrism. Somehow, The mathematician Rheticus, a Protestant banned from the Catholic lands Copernicus lived in managed to make the dangerous overland journey to Copernicus's home, and managed to stay in the city he should have been expelled from for two years; long enough to convince Copernicus to publish and help him with organization and editing. We have no knowledge of how this amazing feat was accomplished, in the absence of any historical record, Ms Sobel inserts a fictional interlude where she imagines, in play form, what might have happened. While it is an unusual construction in a work of non-fiction, I think it works, inviting the reader to more fully imagine the world of Copernicus. After the interlude we return to history, and the frantic rush to the "On the Revolutions of the Heavenly Spheres" into press. Almost everyone with an interest in astronomy will know the story of how the completed manuscript copy of "On the Revolutions.." was pressed into the dying Copernicus hands, Ms Sobel fleshes out that story. Even in these days of electronic compositing and email, proof reading and correcting manuscripts is a painful process, just imagine what it was like when it took days to typeset, print and dry a page before sending the pages hundreds of laborious miles for someone to pore over them. The reactions to "On the Revolutions...." are treated well (the Catholic Church was possibly the first to experience the Streisand Effect when it listed Copernicus's book in the index of proscribed books). Arthur Koesteler famously described "On the Revolutions" as the book nobody read. Now, I wouldn't trust Kosteler's description as far as I could spit a rat, and Ms Sobel does us a signal favour by introducing a new and wider audience to Owen Gingerich's work showing that in fact it was the book everyone read. Copernicus's legacy was not just the heliocentric theory, although that was significant enough, but the approach of marrying careful and meticulous observation with detailed theory was the forerunner of the modern scientific method. The Gregorian calendar we use today depended on Copernicus's determination of the length of the mean solar year. Ms Sobel has produced a modern and compelling work which locates Copernicus and his work firmly in the history of the his time, yet makes him understandable in our time. you will find a brief but understandable explanation of the equant on page 20-21 of the hardcover edition of "A More Perfect Heaven", but the details and implications are not explored. Copernicus's removal of the equant was hailed by his contemporaries as a significant achievement, but you really need to understand the Aristotelian world view to see why this was. one of the reasons motion had to be uniform and circular in the Aristotelian universe, apart for the idea that circles were perfect, and reflected the perfection of the heavens and the creator, was that any deviation from perfect, circular motion would result in a vacuum, which was not permissible in the Aristotelian universe. See Zero, the Biography of a Dangerous Idea for a fascinating look at this.